Stirlitz Media Logger 6.0 software improves general performance and compatibility across a variety of players. Stirlitz Media Logger 6.0 (SML 6.0) was recently released. It is the latest generation of IP-native broadcast & OTT logging software. New in SML 6.0 are H.265 and UHD/4K sources and support with new H.264 server-side codecs. It now supports MPEG-TS over IP broadcast from SML for diagnostics or re-broadcast, and stores the original TS and/or (recompressed) proxies, preserving all embedded metadata. SML 6.0 also offers frame-accurate exports to editor-friendly formats with fast, client-side export to MP4 and MOV, with recompression and GPU acceleration. 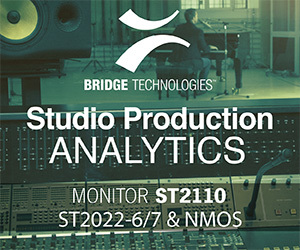 Also new is basic MPEG-TS monitoring with configurable alarms. Stirlitz Media Logger software is designed to be the most user-friendly logger available. It is native IP, captures and stores any number of 4K/UHD, HD, SD or monitoring-quality video sources and it adjusts to workflows. It runs on a generic Windows platforms with a local server or in the cloud. Users can access the recorded video through Timeline based SML (web) Players on workstations (Windows/OS X) and mobile devices (Android & iOS).